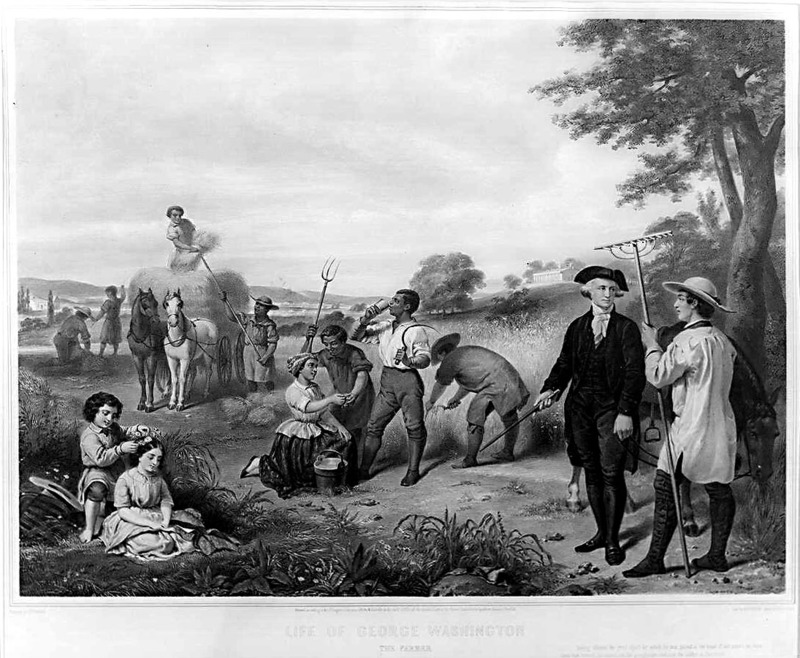 George and Martha Washington owned hundreds of slaves over the course of their lives. The names of many are known, but most of the details of their lives have been lost to history. Here’s the story of one woman who hasn’t been forgotten. In the early 1770s an English tailor named Andrew Judge signed a contract to work as an indentured servant at Mount Vernon, George Washington’s plantation in Virginia. Indentured servitude was a common way for Europeans with no money to pay their way to the American colonies. By signing the contract, Judge agreed to work for Washington for a set period of years in exchange for his passage to Virginia, plus his room and board for the length of the contract. At Mount Vernon, Judge made military uniforms and other clothing for Washington. He also taught his tailoring skills to Washington’s slaves so that when his term as an indentured servant was up, they would be able to do the tailoring themselves. Around 1773 Judge fathered a baby girl with an African American slave named Betty, who worked as a seamstress at Mount Vernon. They named their child Oney, but though Judge was white and free, Oney was born a slave because her mother was a slave. In the eyes of the law, she was “property” and belonged to the Washingtons; neither Betty nor Andrew had any parental rights over their child whatsoever. Oney became a favorite of Martha Washington’s and served as her personal attendant, helping her wash and dress, and accompanying her on social calls. Judge was one of eight slaves who accompanied the Washingtons to New York City, then the nation’s capital, when Washington was elected president in April 1789, and then to Philadelphia when the capital moved there in 1790. In Philadelphia, Judge enjoyed a measure of freedom unheard of at Mount Vernon. She ran errands around the city unsupervised, and in her limited free time, she explored on her own. President Washington even gave her and other slaves of the household money for the theater, the circus, and other entertainments in the city. As the president soon learned from his attorney general, Edmund Randolph, the slaves had the law on their side. Under the terms of the Gradual Abolition Act, slaves who’d been brought into the state by nonresidents (including Washington and Randolph) and who lived there for six consecutive months became free citizens automatically. Slaves owned by members of Congress were specifically exempted from the law, and Washington and Randolph had assumed that their slaves were also exempt. They were wrong. Randolph learned as much in 1791 when his slaves demanded their freedom when the six months were up—and got it. To prevent the same thing from happening to Washington’s slaves, the attorney general advised the president to rotate his slaves out of state for a few days every six months before the deadline was up. Moving slaves out of state for the purpose of denying them their freedom was illegal, but Washington did it anyway. He kept it up for the rest of his presidency, instructing his secretary that he wished “to have it accomplished under the pretext that may deceive both them [the slaves] and the public.” Accordingly, when the president’s slaves were sent back to Mount Vernon for brief visits ahead of the six-month deadline, they were told they were being sent home to spend time with their families. Martha Washington did her part by taking her slaves across the state line into New Jersey for short overnight trips. In this way she denied Judge her chance at freedom in May of 1791. Judge knew that if she returned to Mount Vernon when Washington retired, what little freedom she’d had in Philadelphia would be gone forever. But it wasn’t until 1796, when Washington was nearing the end of his presidency, that she decided to escape. She did so after learning that Martha Washington was planning to give her away as a wedding present to her granddaughter, Elizabeth Custis, whom Judge knew to be a moody and vindictive woman. Judge hid out somewhere in Philadelphia; she never revealed where or for how long. She had to lay low because of an advertisement in the Pennsylvania Gazette giving her physical description (“…a light mulatto girl, much freckled, with very black eyes and bushy hair…of middle stature, slender, and delicately formed, about 20 years of age”), offering a $10 reward for her capture. When she felt safe enough to venture out, she made her way to the Philadelphia waterfront and boarded a ship called the Nancy, whose captain, a man named John Bowles, was known to be sympathetic to escaping slaves and who may have had “Black Jacks”—free African American sailors—on his crew. Judge sailed to Portsmouth, New Hampshire, and disappeared into the free black community there. That probably would have been the end of her story had a family friend of the Washingtons, Elizabeth Langdon, not spotted her walking on the street in Portsmouth a few months later. Word soon got back to George and Martha Washington that Judge was in Portsmouth. As odd as it may sound to modern ears, the Washingtons were actually stunned and hurt that one of their favorite slaves—“more like [our] child than a servant,” as Washington put it—had escaped. They could not bring themselves to accept that she’d done so out of a genuine desire for freedom. Instead, they convinced themselves that she’d been “seduced and enticed off by a Frenchman” (a recent visitor) and tricked into escaping against her own best interest. There’s no evidence that the man in question had anything to do with the escape, but the Washingtons feared that he’d gotten her pregnant and abandoned her. They were determined not just to recover their “property” but also to return Judge to the safety, as they saw it, of home. Once again Washington was willing to flout the law where his slaves were concerned. Under the terms of the Fugitive Slave Act, which he himself had signed into law in 1793, slave owners were required to go into open court and provide proof of ownership of an escaped slave before crossing into another state to capture them. But Washington wanted to avoid publicity. So he ignored the law and instead asked his treasury secretary, Oliver Wolcott Jr., to order the customs collector in Portsmouth, a man named Joseph Whipple, to capture Judge and put her on a boat back home. Whipple had no reason to doubt Washington’s pregnant damsel-in-distress story—he was the president, after all—and was more than happy to aid in rescuing Judge from the harm she’d supposedly fallen into. After discovering where Judge was living, Whipple secretly booked passage for her on a ship to Philadelphia. He waited until the day the ship was due to sail, then he approached her, introduced himself, and made a phony offer of a job with his own family. He hoped either to grab her and drag her onto the ship or trick her into coming aboard voluntarily. But as Whipple talked to Judge, he realized that she hadn’t been seduced by a Frenchman, wasn’t pregnant, wasn’t in distress, and in fact was in Portsmouth of her own free will. “She had not been decoyed away as had been apprehended, but that a thirst for compleat freedom…had been her only motive for absconding,” Whipple explained in a letter to Wolcott. She expressed great affection and reverence for her Master & Mistress, and without hesitation declared her willingness to return and to serve with fidelity during the lives of the President and his Lady if she could be freed on their decease, should she outlive them; but that she should rather suffer death that return to slavery and [be] liable to be sold or given to other persons. To enter into a such a compromise with her, as she suggested to you, is totally inadmissible…It would neither be politic or just to reward unfaithfulness with a premature preference; and thereby discontent beforehand the minds of all her fellow servants who by their steady attachments are far more deserving than herself of favor. Bassett was the guest of Senator John Langdon while visiting Portsmouth, and after the first visit to Judge, he confided to Langdon that he’d been instructed to seize both Judge and her daughter by force if necessary and would do so in the coming days. Langdon, a longtime friend of the Washingtons, was nonetheless so disturbed by what he heard that he slipped out of the house while Bassett was eating dinner and warned Judge of the danger. She fled to Greenland, New Hampshire, and hid there with friends. George Washington died a few months later, on December 14, 1799; Martha Washington followed in May 1802. Ownership of Oney Judge and her three children now passed to relatives on Martha’s side of the family, but there’s no evidence that they ever tried to reclaim Judge under the Fugitive Slave Act. This article is reprinted with permission from Uncle John’s Factastic Bathroom Reader. 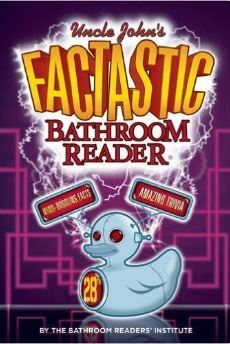 All of Uncle John’s Bathroom Reader favorites are packed into these 512 glorious pages – from little-known history to the origins of everyday things—plus odd news, weird fads, quirky quotes, mind-bending science, head-scratching blunders, and all sorts of random oddities. Oh yeah, and thousands of incredible facts! Thank you for introducing my whole family to Bathroom Readers. These articles always make the best dinnertime discussions. During the Revolution the British had their own emancipation program. Slaves coming over to British lines would be freed thereby denying their labor to the rebels. At the end of the war in 1783 and the Treaty of Paris was being implemented, Washington went to New York, a Crown and Loyalist stronghold. He wanted the British to return the fugitives. The British refused and the runaways joined Loyalists in their migration to Nova Scotia and what would become New Brunswick.